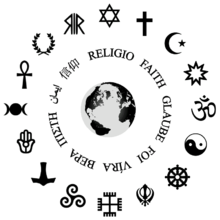 Religious symbols in clock-wise order from top: Judaism, Christianity, Islam, Bahá'í Faith, Hinduism, Taoism, Buddhism, Sikhism, Slavic neopaganism, Celtic polytheism, Heathenism (Germanic paganism), Semitic neopaganism, Wicca, Kemetism (Egyptian paganism), Hellenism (Greek paganism), Italo-Roman neopaganism. A critique of Geertz's model by Talal Asad categorized religion as "an anthropological category." Many religions have narratives, symbols, traditions and sacred histories that are intended to give meaning to life or to explain the origin of life or the universe. They tend to derive morality, ethics, religious laws, or a preferred lifestyle from their ideas about the cosmos and human nature. According to some estimates, there are roughly 4,200 religions in the world. The word religion is sometimes used interchangeably with "faith" or "belief system", but religion differs from private belief in that it has a public aspect. Most religions have organized behaviours, including clerical hierarchies, a definition of what constitutes adherence or membership, congregations of laity, regular meetings or services for the purposes of veneration of a deity or for prayer, holy places (either natural or architectural) or religious texts. Certain religions also have a sacred language often used in liturgical services. The practice of a religion may also include sermons, commemoration of the activities of a god or gods, sacrifices, festivals, feasts, trance, rituals, rites, ceremonies, worship, initiations, funerals, marriages, meditation, invocation, mediumship, music, art, dance, public service or other aspects of human culture. Religious beliefs have also been used to explain parapsychological phenomena such as out-of-body experiences, near-death experiences and reincarnation, along with many other paranormal and supernatural experiences. Religions that originated in East Asia; namely Taoism, Confucianism and Shintoism, and religions and traditions related to, and descended from them. Religions that originated in the Indian subcontinent; namely Hinduism, Jainism, Buddhism and Sikhism, and religions and traditions related to, and descended from them. Religions that originated in the Middle East; namely Zoroastrianism, Judaism, Christianity, and Islam, and religions and traditions related to, and descended from them. Certain Christian groups are difficult to classify as "Eastern" or "Western." Many Gnostic groups were closely related to early Christianity, for example, Valentinism. Irenaeus wrote polemics against them from the standpoint of the then-unified Catholic Church. Religions that consist of the traditional customs and beliefs of particular ethnic groups, refined and expanded upon for thousands of years, often lacking formal doctrine. Note: Some adherents do not consider their ways to be "religion," preferring other cultural terms. Religions that cannot be classed as either world religions nor traditional folk religions, and are usually recent in their inception. ^ "World Religions Religion Statistics Geography Church Statistics". Retrieved 5 March 2015. ^ "Key Facts about Near-Death Experiences". Retrieved 5 March 2015. ^ a b "Welcome to Jainworld – Jain Sects – tirthankaras, jina, sadhus, sadhvis, 24 tirthankaras, digambara sect, svetambar sect, Shraman Dharma, Nirgranth Dharma". Jainworld.com. Retrieved 2012-04-24. ^ Subba, J. R. (1998). The Philosophy and Teachings of Yuma Samyo (Yumaism): The Religion of Limboos of the Himalayan Region. Sikkim Yakthung Mundhum Saplopa. ^ "Irenaeus of Lyons". Retrieved 5 March 2015. Eliade, Mircea, ed. (1987). The Encyclopedia of Religion. 16-volume Set. New York: MacMillan. ISBN 0029094801. Melton, J. Gordon; Baumann, Martin, eds. (2010). Religions of the world: a comprehensive encyclopedia of beliefs and practices. 6-volume Set (2nd ed.). Santa Barbara; Denver; Oxford: ABC-Clio. ISBN 978-1-59884-203-6.